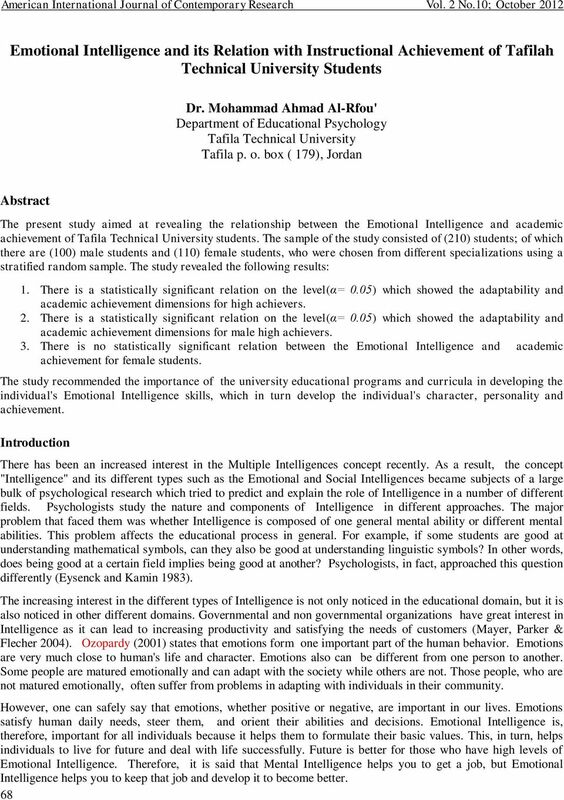 Download "Emotional Intelligence and its Relation with Instructional Achievement of Tafilah Technical University Students"
3 American International Journal of Contemporary Research Vol. 2 No.10; October 2012 Goleman (1995) adds that the university environment does not provide emotional safety for students. This creates a stressful, depressive, nervous environment for students. As a result, they become distracted which affects their education and self confidence. Goleman (1995) also points out that one of the most distinctive features of Emotional Intelligence is that it can be developed by practice and training. Some studies that tackled the difference between Emotional Intelligence and Mental Intelligence show that there is a relation between the two types of intelligence (Ciarrohi, Forgas & Mayer, 2001; Woitazwski & Aslsma 2004) while others show the opposite (Barachared, 2002). 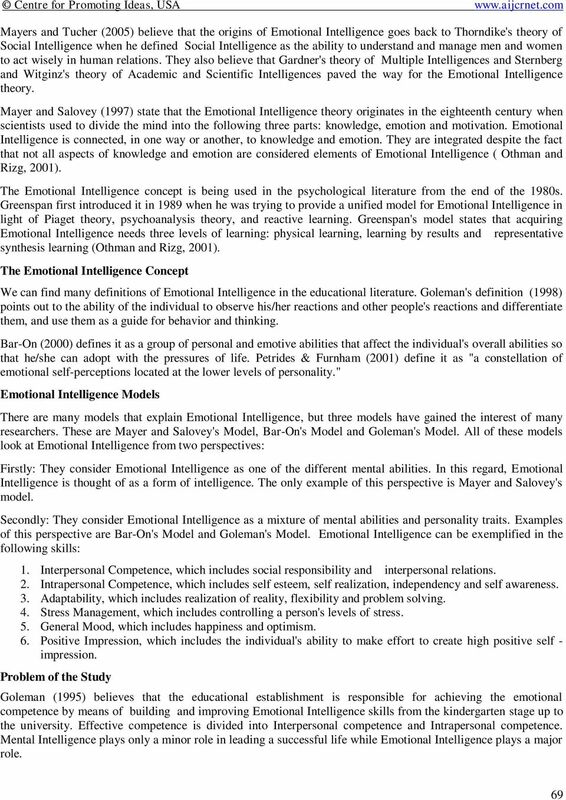 Lam and Karby's study (2002) state that Emotional Intelligence has an interpretive ability that describes individual's performance more than that of the general intelligence. 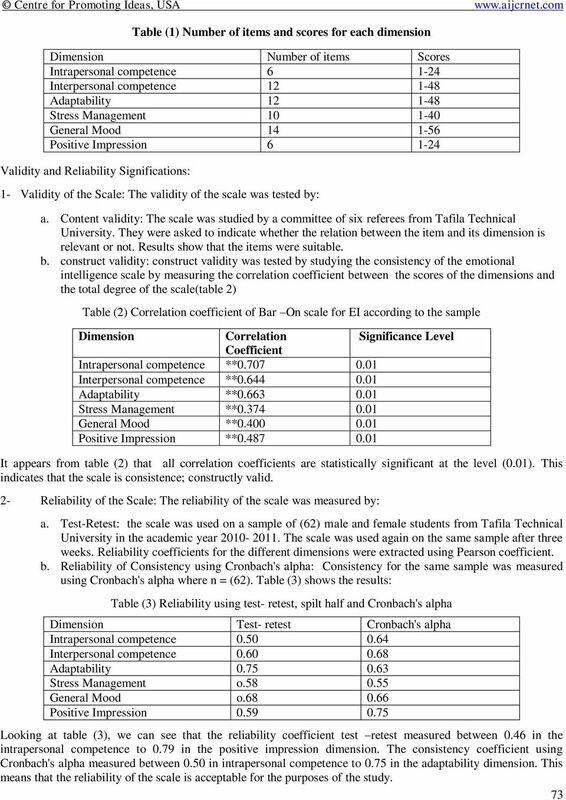 Thus the problem of the study can be summarized as examining the correlative relation between the performance using On-Bar Emotional Intelligence measurement scale and the of the population of the study for high achievers of Tafila Technical University, according to the variable of gender. 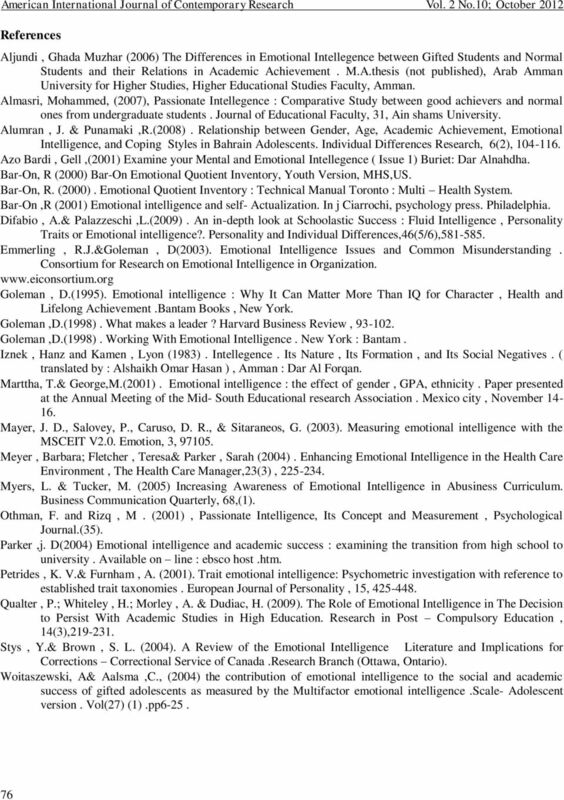 Significance of the Study Researchers like (Gardner 1983, Bar-On 1988, Mayer and Salovey 1990, Goleman 2000, Sahpero 2001) confirmed the correlation between general Intelligence and Emotional Intelligence is weak. They pointed out that general intelligence does not determine the level of happiness in people's lives. They added that Emotional Intelligence tackle the individual's social skills and his/ her success and welfare in life. The significance of the study can be noticed in the following points: Taking care of the high achievers and understanding their needs is a priority for any successful society. 2. Determining the Emotional Intelligence level of high achievers is part of the educational process. 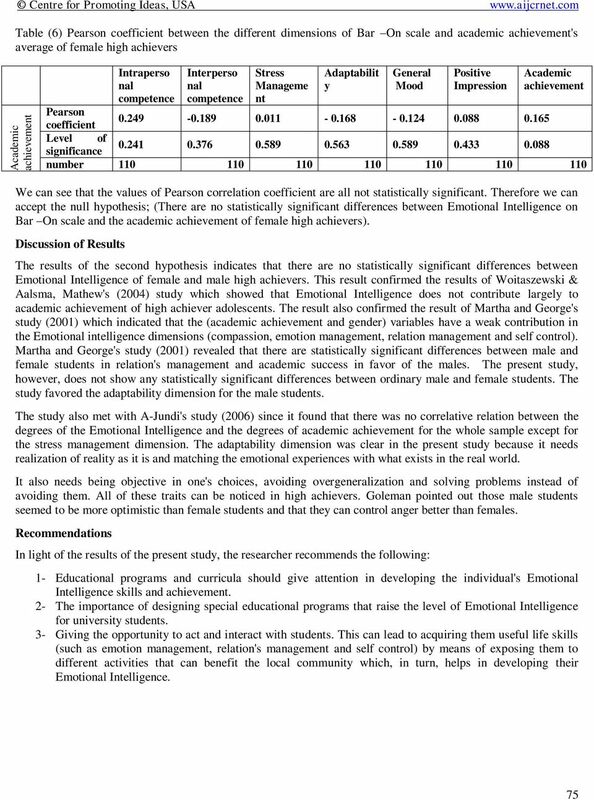 Therefore, the current study tries to explore the Emotional Intelligence level of high achievers in order to raise it among all students. This is because of the fact that Emotional Intelligence is important for individuals in their lives in general. 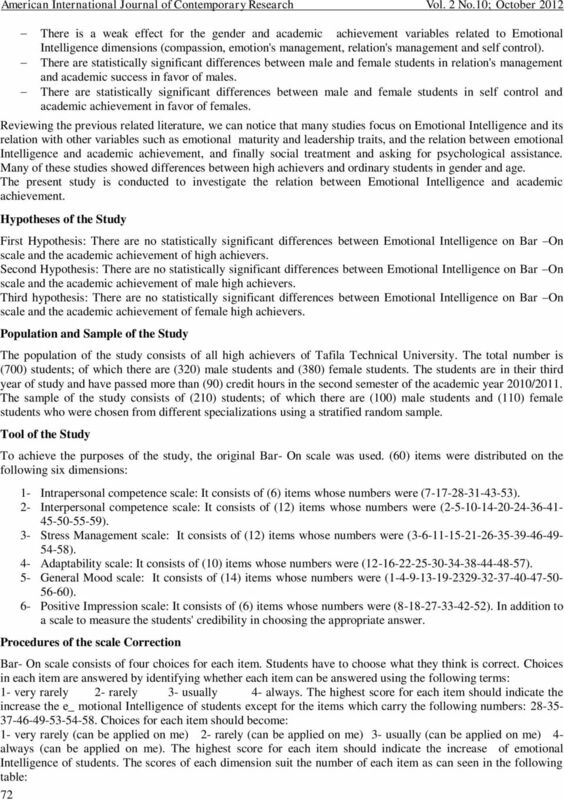 Purpose of the Study The study aims at revealing the Emotional Intelligence level of high achievers in Tafila Technical University as well as comparing male and female students in this respect. Terms of the Study Emotional Intelligence: Bar-On (2010, p:33) defines it as a mixture of emotional, social and personal abilities and dispositions that give the individual the chance to adapt with difficulties and pressures. 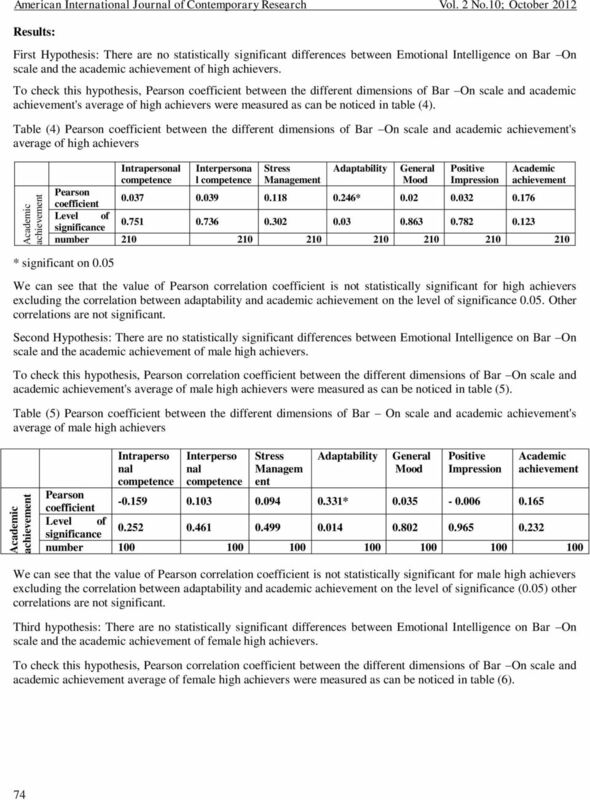 Emotional Intelligence can be defined as the number of all scores that an individual gets when he/she is submitted to Bar-On Measurement Scale. The scale includes interpersonal, intrapersonal, adaptability, stress management, general mood and positive impression. High Achievers: Students who have unusual abilities and better performance compared with others. In the present study, they are high achievers in Tafila Technical University who obtained more than 80% and who are in their third year of study and passed more than 90 credit hours. Limitations of the Study 1. Generalizing the results of the study depends on the sample and its degree of representation. 2. The sample includes only high achievers from Tafila Technical University during the academic year 2010/2011. Previous Literature A great bulk of literature has been conducted on Emotional Inelegance and its different dimensions. 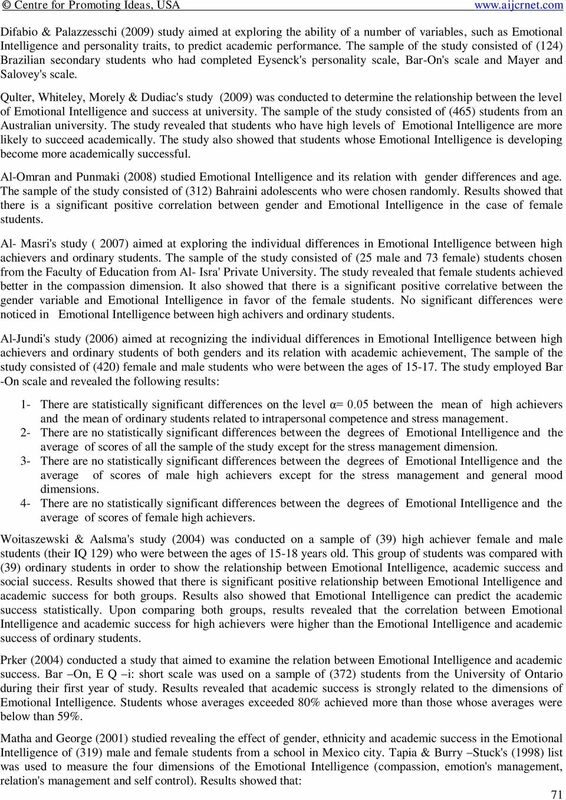 We can give the following examples: Al-Gharaibeh's (2011) study which was conducted to reveal the Emotional Intelligence of intermediate High achievers and intermediate ordinary students of the Saudi area of Al-Qaseem. The sample consisted of (144 High achievers and 72 ordinary students). 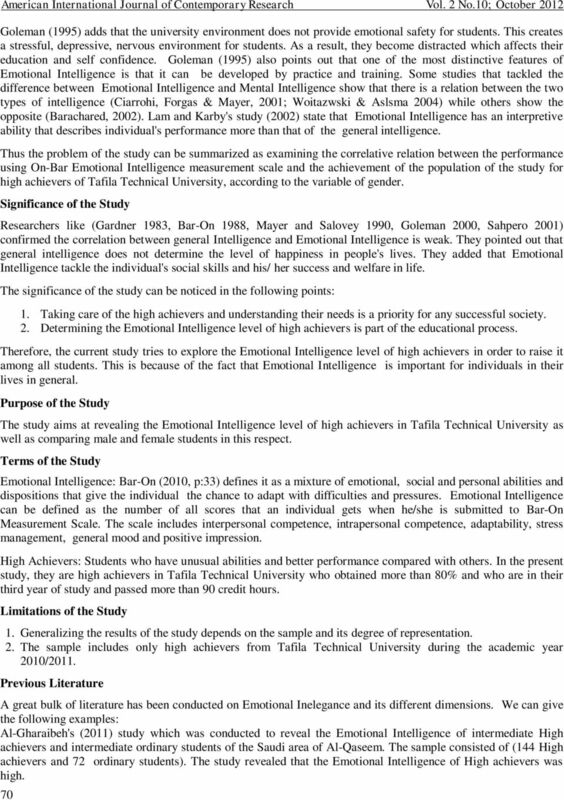 The study revealed that the Emotional Intelligence of High achievers was high. Assessing Stress among University Students Dr. Ahmad. M. Thawabieh Faculty of Educational Sciences Department of Educational psychology Tafila Technical University Naour 11710, P.O-Box (82) Jordan Dr.
Is Test of Performance Strategies (TOPS) a Precise Tool for Iranian Adult Athletes? Research Skills for Psychology Majors: Everything You Need to Know to Get Started Reliability Reliability and validity, the topics of this and the next chapter, are twins and cannot be completely separated. Chapter 1 Assignment Part 1 Careers in Psychology 1. Which of the following psychological professionals must always have a medical degree? a. psychologist b. psychiatric social worker c. psychiatrist d.